Dave Robison has lived in northwest Cape Coral since 2002, when he moved down from Cincinnati, paying $160,000 for his house. He figured that he would stay until his house fetched enough to allow him to retire full time in Mexico. Now, he bitterly regrets that he didn’t cash in back in 2005, when the house was worth perhaps $400,000. He walks his two greyhounds past a tan stucco house on the corner, where the grass on the lawn reaches three feet high, possibly sheltering possums and snakes. An official abatement notice is tacked to the front door, ordering the owner — someone in Reseda, Calif. — to cut the grass. A house across the street is similarly forlorn. Farther down the block, another house sits cloaked in overgrown shrubbery with yet another abatement notice tacked to the door. Two years ago at this very house, I met the two women who were then living there — Elaine and Charlene Pellegrino — a mother and daughter. They were sifting through the belongings of Elaine’s husband, Charlene’s father, who had recently died, leaving them with two troubled businesses to run and debts they couldn’t manage. Elaine Pellegrino, then 53, was disabled, living on Social Security. Her daughter was jobless. They had resigned themselves to losing their home and had stopped making the mortgage payments. Yet they were cognizant that they could stay for many months as their case worked its way through a local court system already overwhelmed by foreclosures. Now their days there have ended. Tax documents sit in a rain-matted stack in front of the garage. A “for sale” sign lies warped and discarded in the weeds. Inside the house, bills are scattered across the floor with playing cards, a March 2008 TV Guide and the innards of a VCR. A plastic trash bag brimmed with foreclosure documents. 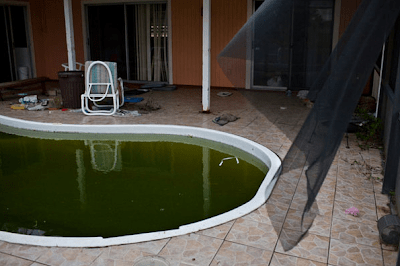 Behind the house, green slime chokes the swimming pool — the same green slime that now colonizes countless pools left to the elements in South Florida. The Pellegrinos moved out in July 2008, Charlene explains. A bathroom pipe had burst, and mold had grown on the walls. She and her mother couldn’t afford repairs. The strangest thing was how the bank implored them to stay, she says. Even after it became clear that they were not going to pay their mortgage, the bank figured that it would be better having them there to deter scavengers who would strip out the cabinets, the wiring, the toilets. You probably won’t be surprised to hear that the super-ultra-lux mall a few blocks from where I’m staying and which serves as my lifeline to the better papers and suitable workspace (via Barnes and Noble) and nightly drinks (via a series of faceless though upscale restaurants) doesn’t seem to be suffering much from the downturn. “Sorry to have been away”?! I should think so. You should apply for leave next time before taking off like that. Can I just say I don’t think the grass on the front lawn of my house was a lot shorter than three feet when I cut it just before Christmas? Just as well we don’t have snakes in New Zealand, and that our neighbours don’t know about abatement notices. Also: it reminded me of this somehow.